International Journal of Research in Health Sciences,2015,3,2,332-336. 1-Associate Professor, 2,3-Assistant Professor, Department of General Surgery, Pt.J.N.M.Medical College, Raipur,Chhattisgarh, INDIA. Introduction- Empyema thoracis is purulent collection in the pleural space. Pleural empyema is mostly caused by speeding infection from lung. This process has several steps, from pneumonia to parapneumonic effusion, uncomplicated empyema, and complicated septate empyema and at the end fibro thorax. Surgical treatments tube thoracostomy and thoracotomy with decortications ,physically remove the problem which are the causes of the lung function disorder, so after it, a better lung function is expected post operatively. With the above background the present study was conducted to assess the change in lung function of paediatric age group patients of empyema thoracis, after definite intervention. Material and methods- The present prospective study was conducted in department of general surgery, Pt. J.N.M. Medical College and Dr BRAM hospital, Raipur (C.G. ), India. 40 patients according to above mentioned inclusion and exclusion criteria, getting admitted during the study period were taken under the study. Patients were subjected to undergo either tube thoracostomy (ICD insertion) or thoracotomy with decortication. In the Post operative period the lung function of the patients was be measured at 1 week, 15 days, 1 month, 3 month, 6 month interval. 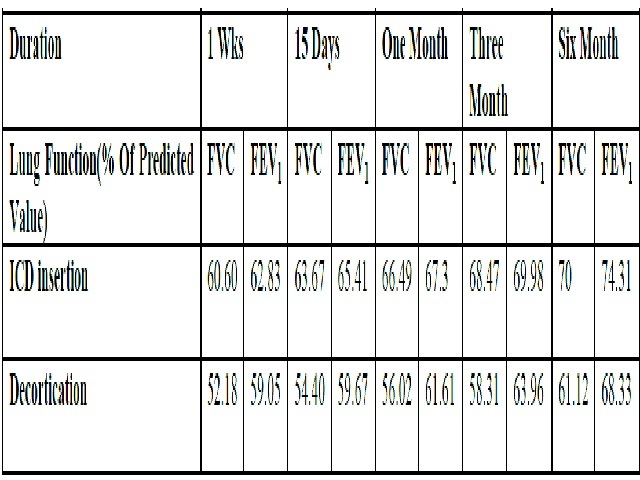 Preoperatively percentage predictive value of lung function is compared with six months postoperatively percentage predictive values of lung function using paired t test. Results- In our study of 40 cases, it was found that mean age of presentation of empyema for ICD insertion was 6.6 yrs and decortications was 6 yrs. Percentage predicted value of FEV1 and FVC was increased significantly before and after definitive procedure. Conclusion- Pleural pus removal by ICD insertion results in significant improvements in lung function, in early stage 1 empyema, improving with time, and good function found after 6 months. Thoracotomy with decortications done in cases which had thicker peel, in fibrinopurulent phase of empyema and even still later organized stage, significant lung function improvement at follow up after 6 months.